We are upgrading to an in ground. Pool builder is coming next week to see the sight and get a design plan. Is there anything specific I should be asking or looking out for. Thanks. - What type of in-ground (plaster, fiberglass or vinyl)? Don't let them talk you into one of their 'package deals' unless you can tweak it a little. Thanks. We're looking at a 18x36 vinyl. The kids would like a slide. Is th a t something that should go in now? Maybe all it later? Do not let them talk you into any magic sanitization systems like, UV system, or Ozone System, or Mineral system "to reduce the amount of chlorine you need"... All magic, but no rabbit.. I would also think twice before buying an in-floor cleaning system.. I lived in Bangor, many years ago. It is where I met my wife of 50 years.. but I don't hold that against the city..
You rang?? HI! I can't wait to see what you have planned! Share EVERYthing here first before you sign. We have been doing this for quite a while so know what is good and what is not. Thanks for the info. I'll post more after I talk to PB. 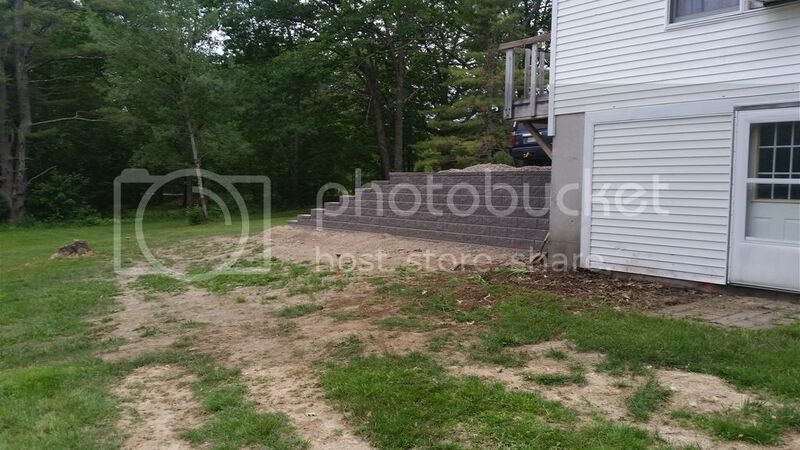 This is where i would like to install the pool,but not sure if its possible with the grade of my back yard thoughts? And yes the pine tree is going away. Sorry for the crude lines, edited with my phone. It can go anywhere you want it BUT it will cost you more there as you will have to have some kind of retaining wall to keep the rain water from coming down into the pool. Why do you want it there? Not saying it is a bad spot. I just want to learn how you think and what your thoughts are so I can help spend your money to make sure you get what you want. The septic system is between the house and existing pool. Would like to keep it close to house for two reasons. 1 is less pipe and wire. 2nd is further out continues to drop and gets really wet in the spring. 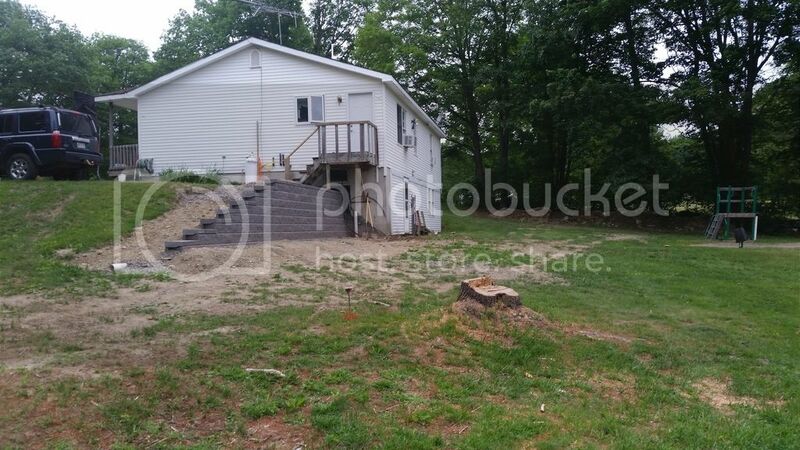 It's a toss up build a retaining wall or bring in more fill to fit pool up beside the house on the high ground. The retaining wall can be made in such a way it is part of the pool experience. A sitting area that is pretty if done right. I highly recommend you get more than one quote, if you are able, as there are probably more options out there than the one idea from this one PB. Money thing I wish I would have known about and requested is unions on everything on my equiptment pad. With unions, when you have to replace equiptment, it's an easy screw in type job. We only have unions on our salt cell. Also, get as many ch deck as you can possible afford. Furniture takes up a lot more space than you think it will. For cleaning, a robot is really the best way to go! Have fun! Congratulations on your future upgrade!! Yeah the mineral part of it is the "magic" Jim talked of. It causes major problems down the road AND it is $$ to replace. Tell him no thank you on that. Try to get model numbers for all of the equipment please so we can check it out. Was it vermiculite he said he would put on the bottom? That is what most use. Yes, that is the 'magic' that Jim was talking about. You, for sure, don't want that. It adds copper and other stuff that just ends up messing up your pool in a fairly short time. Remember I mentioned 'tweaking' a package. This is a prime example. You want some sort of SWG or liquid chlorine dispenser system instead of the 'magic' fusion thing. No it wasn't vermiculite it was a cement type base. Trees are gone. All prepared for retaining wall. Blocks will be here Thursday. Side note. Got rid of the mineral injection thing and going swc. Nice progress! That is some good cleaning up! Wall is done! digging starts this week.